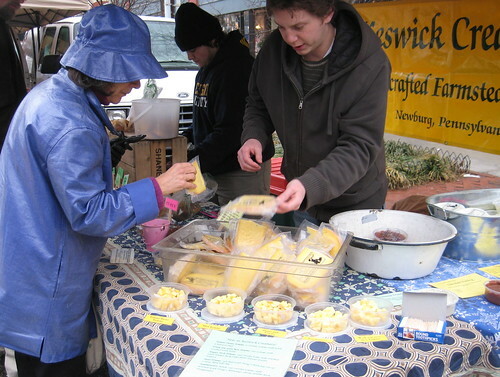 A Keswick table displays Tomme cheese samples. Family farms often face an uphill climb just to reach level ground. For Keswick Creamery, that hike just got steeper. Rather than give in, the popular artisan farmstead cheese makers who sell at six area farmers markets have devised a way to keep their livelihood going. Mel and Mark Dietrich Cochran, who run the creamery, recently learned that they have until September 1 to raise $300,000. If they do not hit the goal, Mel’s father will opt to continue with his plan of selling off the equipment and shuttering the operation. The Dietrich Cochrans have looked to a community-supported agriculture (CSA) model and an online ordering tool to sell shares in their business. Each purchase of a Keswick Creamery Cheese CSA share brings them closer to continuing the family business. For more information about Keswick and the CSA, visit the Keswick Creamery website. The Columbia Heights Community Marketplace opened Saturday, June 5, with a kickoff that hit more than a few hallmarks of a community event. The market, which debuted its regular time of 10 a.m. to 2 p.m. in its home at 14th Street and Park Road NW, brought together individuals of different political stripes, shoppers of varied tastes, and members of several generations. Eight sellers offered everything from strawberries and garlic scapes to bratwurst and blue cheese, with some sunflowers, wine vinegar, garden-ready plants, and French pastries as well. Not only did mayoral race foes Adrian Fenty and Vincent Gray stand on the same stage, but nearly the whole City Council (as well as the Ward One representative to the school board, Dotti Wade Love) turned up to make an appearance or sent volunteers to collect signatures get them on the ballot. A gravely-voiced resident who had lived on Kenyon Street for 55 years stood yards away from a pint-sized poet who had barely been walking for five. Dance and music, from performers of every age in between, rounded out the entertainment. Click over to the full article, including video and a photo slide show. Cross-posted from my Examiner.com farmers market site. As a recent American Prospect article made clear, not all farmers markets are geared toward shoppers who need fresh fruits and vegetables the most. 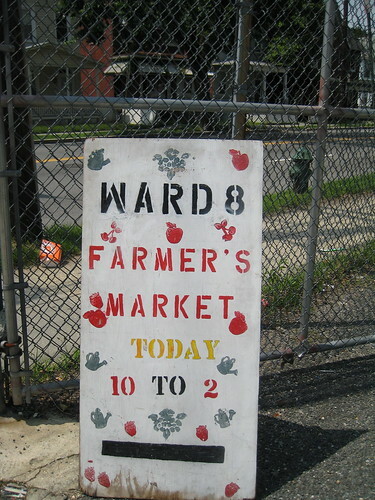 Yet two markets in the District have opened or expanded this season to address that critical constituency. The D.C. Vegetarian Cooking Group has announced that it will put local fare at the center of its June event. 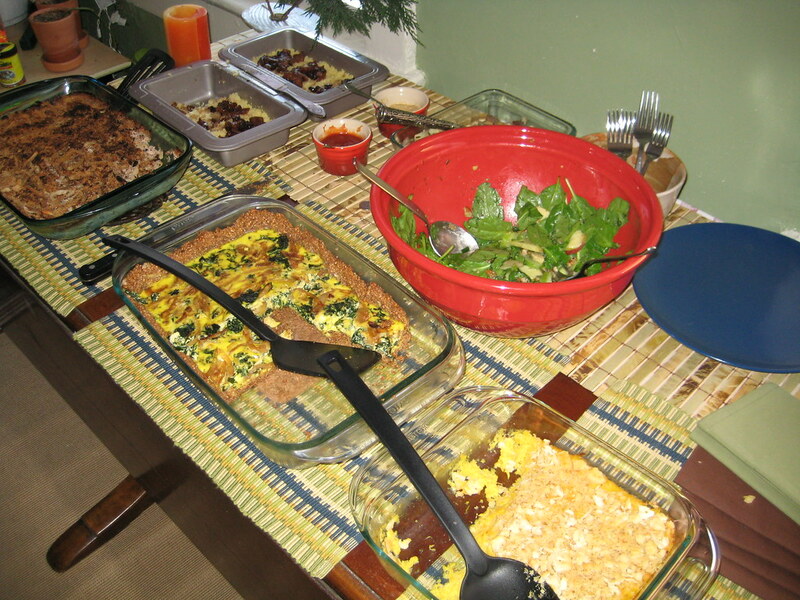 Jack Zahora, who heads the group that meets once a month for a pot luck meal or restaurant outing, is encouraging the members to shop at an area farmers market the weekend of June 5, whip up dishes based on the ingredients they purchase, and show them off at a brunch on June 6. The event will take place at the grill-equipped Columbia Heights home of one of the members. This event comes at an opportune time, as the Columbia Heights Community Marketplace is slated to open that weekend, and the home-hosted brunch is becoming all the rage in D.C.
Zahora, a D.C.-based journalist, has given a preview of the spread. He plans to make a vegetable frittata, baked mostachioli, mimosas, and grilled tomato sandwiches. Other items on the menu include vegan quinoa salad with vegetables, Belgian waffles, and sorbet. For more information, go to the group’s website, Facebook page, or Twitter feed. To join the group and find out the particulars of the brunch location, email Jack Zahora. Wow. It’s been a month since I posted. In that time, I led a Shabbat event about global hunger, finished that enlightening cleanse, sat in on my first farmers market board meeting, interviewed for an article on farmers markets in a major progressive publication, and–just yesterday–put on a brunch fundraiser with locally-sourced foods. I have a lot of catching up to do! For now, though, I’ll just say THANK YOU to the 18 folks who came out to the brunch, and the others who gave remotely (I owe you guys apple-cinnamon pancakes!). …And I’ll tell you that my donation thermometer is bubbling with happiness about my reaching 100+ percent of my goal. …And I’ll post the menu to the brunch. Washington D.C.’s FRESHFARM Markets’ new year started with good news: A mini documentary about the organization would be part of Yachad‘s Our City Film Festival slated for February 14 at D.C.’s Goethe Institute. Not only that, but the film would appear alongside “Nora!” featuring a restaurateur who embraces local and organic food. “I’m thrilled to have a film about FRESHFARM Markets and to document in some way how the markets were created and what vision was behind it,” said FRESHFARM co-director and co-founder Ann Yonkers. Yachad, which mobilizes the Washington-area Jewish community to repair and rebuild lower-income neighborhoods, selected 14 films for the third annual festival and divided them into four categories—Our Body, Our Mind, Our Heart, and Our Soul. “FRESHFARM Markets” will appear in the body category and is, of course, about FRESHFARM and its nine producer-only markets in the D.C. area. 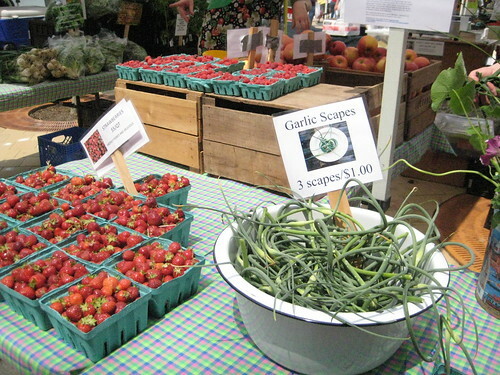 Their markets include such favorites as the Dupont Circle farmers market and the farmers market at the White House. Good news: Although several area farmers markets have closed for the season, plenty stay open year-round. Here is a list of markets in and around D.C. that keep selling through the winter. Most of these feature exclusively local farmers and food artisans who use sustainable practices. Feel free to comment if you know of others! 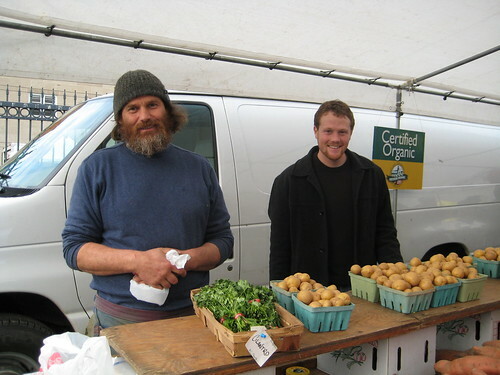 Dupont Circle Farmer’s Market* – Sundays, 10 am to 1 pm during the winter and 9 am to 1 pm the rest of the year, near the Dupont Circle Metro’s North exi. Read more about this market. Squash: a great local food for Thanksgiving. Photo by me. This is a cross-post from my Examiner.com page. Hope it’s helpful! 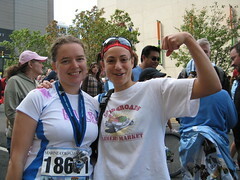 Crossroads update: Going the extra mile (or 10)! The Crossroads spirit was with me on Sunday. 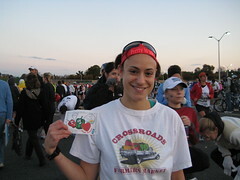 At 6 a.m., I headed down to the starting line of Washington D.C.’s Marine Corps Marathon decked out in my Crossroads Farmers Market shirt and fortified by a well-wishing card from the market’s director. (For anyone interested, my tummy was fortified by some organic coffee and a PB & J on sprouted grain bread–what I’ve found to be an excellent pre-race snack).